California State University, Northridge has been named an Innovation and Economic Prosperity (IEP) University by the Association of Public and Land-grant Universities (APLU). Photo by Lee Choo. Recognizing California State University, Northridge’s strong commitment to regional economic development, CSUN has been named an Innovation and Economic Prosperity (IEP) University by the Association of Public and Land-grant Universities (APLU). Institutions that earn the designation are recognized for their efforts to promote innovation and entrepreneurship, excellence in technology transfer, leadership in talent and workforce development, establishing strong government-university-industry partnerships, and fostering community and “place” development through public service, engagement and outreach, according to the APLU. “This IEP designation by the APLU is a great recognition of our wide-ranging engagement with the Los Angeles area and our strong commitment to student and faculty innovation and entrepreneurship, workforce development and working with diverse community partners through a range of impactful activities and programs,” said Megha Patel, CSUN’s assistant vice president for research and economic development. CSUN began the application process for the Innovation and Economic Prosperity University designation more than a year ago, with the creation of a working group that included Patel; Julia Potter, director of strategic partnerships and special initiatives; marketing professor Deborah Cours, then director of community engagement; manufacturing systems engineering and management professor S. Jimmy Gandhi, director of the Ernie Schaffer Center for Innovation and Entrepreneurship; and Ryan Holbrook, director of the entrepreneurship program in the David Nazarian College of Business and Economics. The working group set out to assess CSUN’s strengths and weaknesses in economic development and a survey of campus stakeholders, including community partners. The application was submitted in December. The working group found that CSUN’s economic impact on the region was nearly $2 billion last year and was responsible for the creation of more than 11,700 jobs. 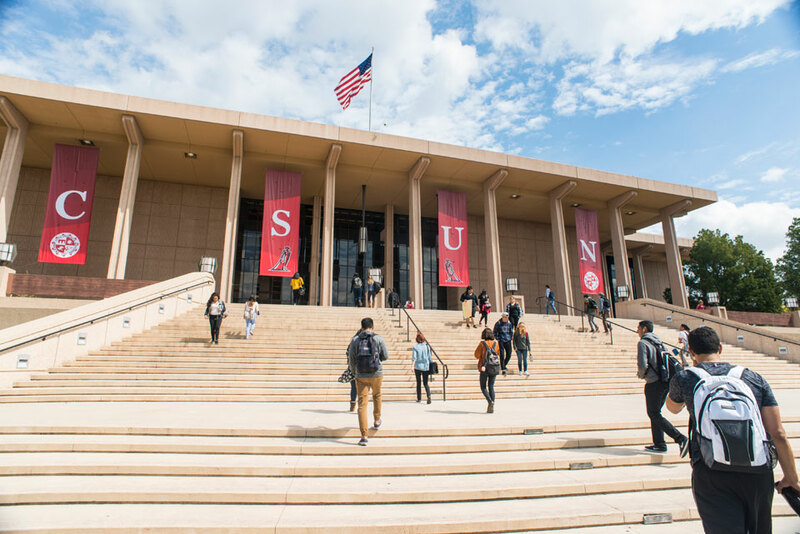 Citing a 2015 Economic and Social Impact Study by Beacon Economics, the working group reported that CSUN students go on to graduate at higher rates and earn more as alumni than those at peer institutions. The application noted several factors as key to the campus’ engagement with the Los Angeles area, including finalizing plans for a five-story, 150-room business-class Hyatt Hotel on campus; the Younes and Soraya Nazarian Center for the Performing Arts, CSUN’s 1,700-seat performing arts center that has been cited by the Los Angeles Times as “a hub for live music, dance, drama and culture”; spearheading the creation of the California State University system’s first multi-campus institute; and creating an on-campus business incubator in partnership with the Los Angeles CleanTech Incubator.